The Hotel Charlotte has been a prominent hotel in Groveland since 1921. During the Hetch Hetchy days the facility also served as a boarding house for a few of the water system project laborers. The adjoining restaurant has been a favorite place to seek repast since circa 1928. After the departure of the Hetch Hetchy construction crews, the Charlotte Hotel and Restaurant was one of the few businesses to remain in operation. Throughout the 1930s and '40s the Charlotte Hotel and Restaurant became the most prominent hostelry in Groveland. 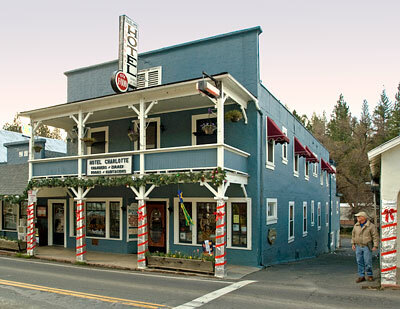 Although both the Charlotte Hotel and Restaurant buildings have been remodeled on several occasions, these structures still contribute a sense of time and place, reflecting both Groveland's bustling Hetch Hetchy construction days and the town's more quiescent tourism days of the 1930s and '40s. Since the mid-1940s the front facades of both buildings have not been significantly altered. Groveland's central core permeates with the ambiance, character, and perhaps romance of a small, western frontier town. The town's linear street-scape is handsomely accentuated by the presence of several frame buildings with false fronts which date from the early 20th century. The subject property makes a fitting centerpiece for this historic built environment. Excerpted from the NRHP nomination dated 5 April 1994.